Mainstream Review 2019: Is Mainstream a Good Hosting? 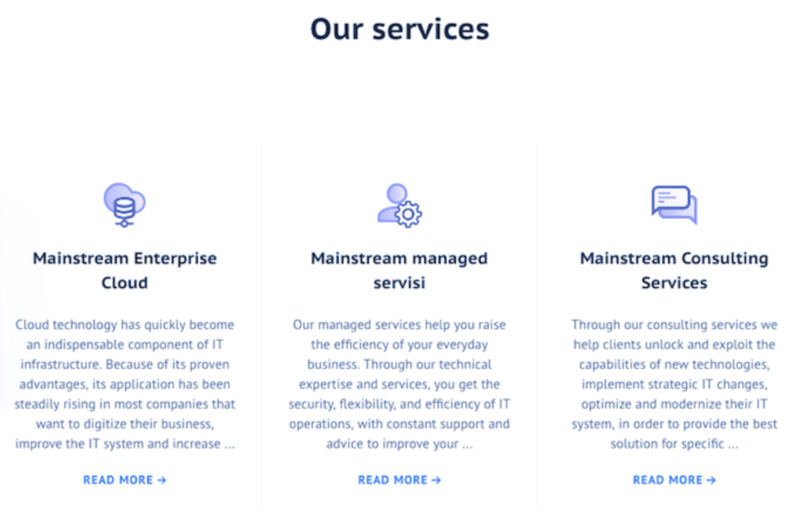 A premium website hosting provider based in Serbia, Mainstream offers enterprise cloud hosting, managed dedicated hosting, and associated consulting services. Founded in 2005, Mainstream is an enterprise-level website hosting provider specializing in managed servers and cloud hosting. They are a niche company – so not as mainstream as the name suggests – working with around 200 customers. They have a global network of Tier III data centers in Serbia, America, and France, and their focus is on websites with high traffic and complex requirements. Their own website is available in Serbian but they also provide support in English. Mainstream clearly offers a premium service that is tailored to the needs of their high-end customers. All of their data centers are Tier III, which means 99.99% uptime, 24/7 monitoring, and complete redundancy at all levels: virtualization, storage, and network. Also, all of their packages include a disaster recovery plan. Since Mainstream aims to provide a fully customized service to their enterprise clients, their website tends toward being vague yet overly-complex for beginners. But their commitment to providing bespoke solutions to meet the business IT goals of high-need is indisputable. The bespoke nature of Mainstream’s not-so-mainstream solutions means that they do not include prices on their website. I would personally prefer at least a ballpark of possible pricing before having to go through a complex quote procedure. That said, after enquiring via email, their prices do seem to be in line with other companies who provide a similar premium website hosting service for enterprise level clients. They offer no incentives such as long-term discounts, money-back guarantees, free trials or a free plan. In short, they are not in the business of supporting small budget-conscious businesses. Mainstream’s support services seem to be limited, with only an online form to get in touch. There is no (published) phone number and no live chat. However, it is possible to contact them via their social media channels, and I have done so on several occasions to receive a quick and helpful response. Since this company’s services are not for self-service customers, there is no online knowledge base. What you do get, if you’re the right kind of customer, is a fully managed solution with 24/7 engineers. Mainstream offers customized end-to-end solutions for enterprise businesses. They have a team of 50 highly trained industry experts and more than 2000 virtual servers. Their infrastructure uses over 16 TB of RAM, and they are hosts to seven out of ten of the busiest websites in Serbia. Wondering how Mainstream stacks up against other Web Hosting companies? Enter any other Web Hosting company and we will give you a side-by-side comparison.